In-line inspection using magnetic flux leakage (MFL) or ultrasonic smart pigs detects many defects caused by third-party damage, but does not properly characterize them so that remediation can be based on defect severity. For example, the severity of damage from a backhoe strike depends more on the characteristics of the resulting gouge than on the dent. Under funding from the U.S. Office of Pipeline Safety, Southwest Research Institute has developed new sensing technology to detect and characterize mechanical damage defects. This paper describes the nonlinear harmonic (NLH) technique and its response to a series of mechanical damage defects that were subsequently pressure tested to failure. Comparisons were made to finite element models of the stress and strain distributions on the pipe surface near the defect. The statistics of pipeline incidents are well-known, including the fact that mechanical damage is the predominant cause of reported incidents. This preponderance of the outside force cause of incidents has prompted funding agencies to make investment in R&D for detection and characterization of that type of defect. However, it should be pointed out that detection of outside force defects by in-line means will not prevent the 70 to 80 percent of such defects that fail immediately upon their initiation. So the target for in-line detection of outside force defects is the 10 percent or so of delayed failures. Even though this target is a small fraction of the total pipeline incidents, it can nevertheless have tragic consequences such as the failure in Bellingham, WA, in 1999. For several years, Southwest Research Institute® (SwRI®) has been involved in a project to refine a detection method for mechanical damage defects, under sponsorship of the United States Department of Transportation. Partners in this work have been Battelle Memorial Institute of Columbus, OH, and the Gas Technology Institute (formerly GRI) of Des Plaines, IL. This paper summarizes the project work and accomplishments to date. The technology that SwRI is applying to the detection of mechanical damage defects is known as non-linear harmonics (NLH). NLH measures the changes in material magnetic properties as effects of stress and strain. Figure 1 illustrates the effects of applied stress on typical magnetic hysteresis curves. Note that tensile loading causes the curves to be steeper (increased magnetic permeability), while compressive loading yields an opposite result. The corresponding effects of plastic strain on the initial magnetization curves are shown in Figure 2. Note that the effects of compressive plastic strain are similar to applied tensile strain, i.e. an increased magnetic permeability. Fig.1 : Magnetic properties vary with specimen loading. Fig.2 : Initial curve and plastic strains. The NLH method reveals the behavior of magnetic permeability at the surface of the metal part. Refer to Figure 3 that shows the basis of the NLH method. If an oscillatory magnetic field is impressed on a ferromagnetic workpiece, the magnetic field that is induced into the part is shaped by the hysteresis curve of the material. Since that curve is not linear, the magnetic induction is not a single-frequency sinusoid like the excitation waveform, but rather contains higher frequencies (harmonics) of the excitation frequency. Of particular interest are the odd harmonics, specifically the third. It has been shown in previous work at SwRI that the amplitude and phase of the third harmonic contain information about the amount of biaxial stress in the material. 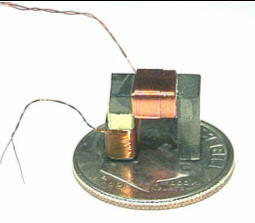 The NLH probe is essentially a small ferrite-core transformer. When the core is placed against a ferromagnetic material, the material forms part of the transformer's magnetic circuit. Thus the output of the transformer depends on the magnetic properties of the tested part. An NLH probe used by SwRI in research on mechanical damage defects is shown in Figure 4. Note that two windings are wound on the single C-shaped core. The required electronics are relatively simple as shown in Figure 5. A sine-wave signal source, with power amplification, if needed, is connected to the probe's primary winding. The secondary sensing coil is first filtered to remove the fundamental frequency, leaving the higher harmonics that carry information about stress and strain. These harmonics are fed to a lock-in amplifier that is locked to the signal generator waveform, which makes it possible to observe amplitude and phase of a particular harmonic of the excitation waveform. In the mechanical damage detection work, the third harmonic was selected. Specifically, the excitation was 10 kHz and the detected harmonic was 30 kHz. Since the sensing of magnetic properties takes place at 30 kHz, the sensing depth into the material is limited to a small fraction of a millimeter. Thus, an in-line inspection for outside mechanical damage, relies on there being an effect at the inner surface. Of course if the defect is a dent, even a re-rounded dent, there was necessarily a disturbance of the inner surface. In addition, for a pressurized pipe, the stress field about an external gouge can extend to the internal surface. Fig.4 : Typical NLH probe. Fig.5 : NLH circuit block diagram. For the DOT project, the critical work was carried out on 2-meter long sections of 24-inch pipe. Defects were installed in the test sections by Battelle using a machine that allows them to vary the loading and movement of different shapes of indenters. The defects are roughly similar to those caused by equipment such as backhoes. Gouges were produced at the center of dents of various depths. At least one defect was made with a gouge having no denting. This phase of the work was carried out on six 2-meter long sections of 24-inch line pipe, each containing three defects installed, against internal pressure, by Battelle. The defects were principally gouges made with three different gouging tooth profiles. The gouges were, in most cases, at the center of dents that had some degree of re-rounding. Table A shows the range of defect sizes. Each of the test pipe sections had a flange neck on one end and a dome closure on the other. Penetrations through the blind flange end cap made it possible to control a scanner carrying NLH probes. Figure 6 shows a CADD drawing of the internal scanner. The probes were spring-loaded on a traveling "spider" which could be positioned at any point on the pipe inner surface by action of two computer controlled stepper motors on the face of the blind flange. One motor controlled the circumferential position of the probes and the other the axial position. Thus, a scan pattern could be implemented to cover the area adjacent each defect. Fig. 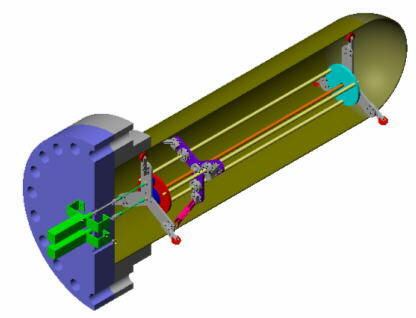 6: CADD drawing of internal pipe scanner for NLH during pressure testing. The first use of the scanner was to scan the specimens before they were outfitted with flanges. During these scans without hydrostatic pressure applied, data were taken from each defect to show its NLH response, and also its configuration. Defect shapes were mapped using the scanner and an infra-red rangefinder unit which could very precisely map the distance from the scanner to the pipe surface. A severity criterion related to structural integrity is critical for mechanical damage defects because a pipeline may contain hundreds of mechanical damage defects besides gouges, such as dents due to rock impingement, the vast majority of which may never initiate cracks nor lead to pipeline failure. Finite element stress analyses (FESA) were performed as part of this project in order to gain insight into the physical meaning of NLH signals. In FESA, the structure is modeled by small volume elements. Loads are applied to the appropriate elements of the model to simulate the actual loading on the structure, and the finite element method is used to calculate the deformations that are produced. In the present work, three-dimensional elastic-plastic models were constructed to simulate the gouging process. Due to the extreme deformations experienced by the pipe wall during gouging, it was necessary to procure special elastic-plastic finite element software called ABAQUSTM/Explicit that automatically re-models the elements as they distort from the optimum shape. FESA were performed to replicate the loading history experienced by the damaged pipes during gouging and under the conditions that the NLH measurements were made. This loading history involved pressurizing pipes to 5.5 MPa and holding that pressure during the gouging process. The vertical and horizontal motions of the gouging tool were monitored as a function of time while the actual gouges were fabricated, and these data were used in the FESA. As the gouging tool retracts, the internal pressure causes the dent formed by the gouging process to be partly removed due to so-called re-rounding of the pipe. After the gouging was completed, the pipes were de-pressurized before being re-pressurized to 5.33 MPa at which pressure NLH scanning was performed. Comparison between the measured NLH signals and FESA results confirm that the NLH signals are related to the stresses and strains generated on the inside surface of a pipe by mechanical damage inflicted on the outside. Compared to the FESA maps that represent an idealized situation, the NLH contours show far less definition and resolution, but even so the similarities between the two sets of contour maps is clearly evident. Fig.7 : NLH patterns for increasing severity of mechanical damage. The foregoing comparisons between NLH signals and FESA results demonstrate that elastic strains predicted by FESA can be used to establish defect severity criteria that are appropriate for use with NLH signal measurements. The severity of a gouged dent will be related to a number of severity parameters, such as the depth of the gouge (which in turn will be related to the depth of the dent formed during gouging); the length of the gouge; and the width of the gouge (if the gouge width is small enough, the gouge takes on the characteristics of a crack-like flaw). By reviewing the FESA results for elastic axial and hoop strains it is possible to identify features on the strain maps that appear to develop as these severity parameters are varied. 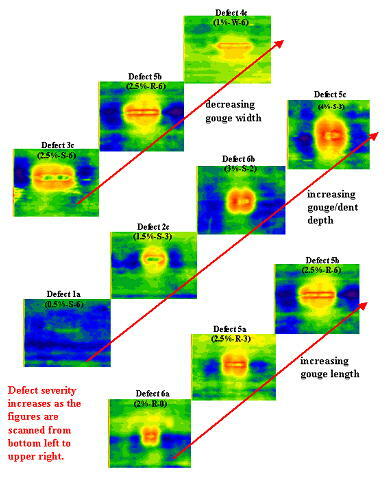 The results of performing this exercise are shown in Figure 7, where changes in the strain patterns are related to changes in the defect severity parameters to produce the defect severity criteria shown in the figure. Pressure tests on pipes containing realistic gouges were performed to determine the order in which the defects failed as an indication of the defect severity. Pressure testing is not perfectly representative of the failure mode of such defects in the field as the normal mode of failure involves time-dependent crack growth due to pressure cycling and other mechanisms, but it was the most representative test allowed by the schedule and budget of the current work. Each pipe section tested contained three defects consisting of gouges of varies lengths, widths and depths. The test matrix is shown in Table A. This table lists the characteristics of each defect together with the measured failure pressures and indications of cracking in those defects that survived the test. The pipes were numbered (3, 4, 5 and 6) and the defects identified by letters (a, b and c). The characteristics of the defects are specified in terms of the dent depths used in the gouging process expressed as a percentage of the outer diameter (OD), the length of the gouges, and the width of the gouging tool. Three gouging tools were used, designated as square (S), rectangular (R), and wedge (W) that had widths of 19 mm, 11.7 mm and 8.4 mm, respectively. The gouges were fabricated while the pipes were under a pressure of 5.73 MPa, typical of gas transmission pipeline pressures. Although six pipes were tested in all, pipes 1 and 2 contained benign defects and failed at their ultimate pressure. Hence, only the results for pipes 3 through 6 are considered for severity validation purposes. Table A: Test results for gouges in pipes pressurized to failure. The table shows the characteristics of each defect, the failure pressure and the observed damage at those defects that did not fail. The four defect severity criteria illustrated in Figure 7 were applied to ranking the severity of the defects in the damaged pipes that underwent burst pressure testing. The results are shown in Figure 8. Also shown in the figure are the rankings that were obtained using engineering judgment to estimate the severity of the defects that caused pipe rupture, and the defects that survived the pressure testing. The engineering judgment utilized as input data the measured burst pressures and visual observations of cracking at the gouges. As can be seen from Figure K, the ranking of the severity of the defects based on the elastic strain maps agrees remarkably well with the ranking based on engineering judgment. Fig.8 : Comparison of four assessment criteria methods. Comparison of NLH data and FESA results has demonstrated that NLH is a viable method for characterizing the severity of mechanical damage in pressurized transmission pipelines in terms of the strain-based criteria. Improvement in NLH resolution would enable mechanical defects in pipelines to be ranked in terms of severity relative to structural integrity, an advance in the use of NDE technology to detect and prioritize mechanically-induced defects, a capability not currently possible with any commercially available ILI tools. SwRI staff members who contributed to this work, besides the authors, include Gary Burkhardt who guided the development of the NLH probes and electronics, Errol Brigance and David Jones who designed and built the NLH scanner and the NLH sensors, Vic Aaron and Steve Clay who were responsible for the pressure testing and failure testing of the pipe segments and Yi-der Lee who performed the finite element modeling and analysis. Thanks are also given to the US Department of Transportation's Office of Pipeline Safety and the Gas Technology Institute who provided the funding for the work.